One month ago, Handshake Media, Incorporated began a social media launch and then a continued social media publicity campaign with its client SmartCollegeVisit. I wrote the following posts, listed in chronological order, to share the path of the launch and campaign. They link to myriad posts written by me, SmartCollegeVisit's founder, Z. Kelly Queijo, and several others, as well as to multiple social media channels. As I wrote in this post, "The social media launch of SmartCollegeVisit involved 4 blogs, 3 Twitter accounts, and 2 business Facebook pages." Watch This! Then, Watch Out! Handshake Media operates a complex network of social media channels, several related to Handshake 2.0, including multiple blogs. One of the strategic purposes of building and maintaining multiple blogs is to provide those invaluable, search engine results-enhancing links in. The post you're reading now on my corporate blog provides "links in" to client SmartCollegeVisit's site, as well as to Handshake 2.0. These new connections continue to build the network of links that contributes to relevance. An additional component of a social media strategy with regard to blog posts involves placement. 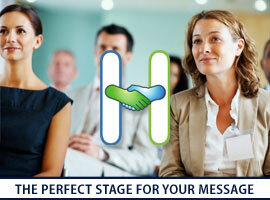 Handshake Media launched a corporate video on December 1, 2009. The video was uploaded to YouTube and embedded in a post on Handshake 2.0. While the Handshake video is on YouTube and has been placed on a page linked to Handshake 2.0's site sidebar, publicity for the video originated from the blog post. We expected - and received - considerable traffic to the video post. What did site visitors who traveled to the post and decided to scroll down to learn more about Handshake 2.0 see placed right next to the video? A post about client SmartCollegeVisit. Handshake 2.0 ® and Handshake ® are registered trademarks of Handshake Media, Incorporated.